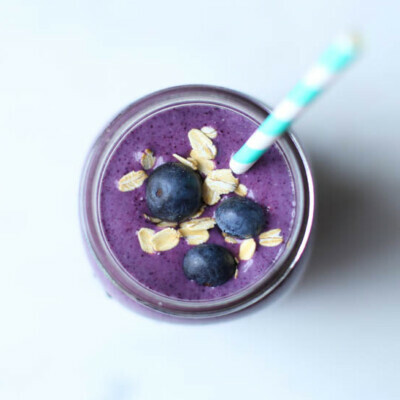 With sweet blueberries, banana, rolled oats, a few walnuts, and milk, this beautiful and nutritious purple smoothie really does taste like a Blueberry Muffin. It’s gluten-free, dairy-free, and includes freezer smoothie pack instructions. 1. Start by adding 1 cup almond milk to a high-powered blender. Then, add all the other ingredients. 2. Blend until smooth. You may need to stop and stir/shake the blender or add up to a 1/2 cup more of almond milk, as needed, to make sure it gets smooth. 2. Seal tightly, squeezing out the air, and freeze for up to 3 months. 3. To Blend: Pour 1 cup almond milk into a high-powered blender first. Break up the ingredients in the bag by hitting it on the counter or crunching it with your hands. Dump the ingredients from the bag in and follow blending instructions above.